Photos courtesy GCCC When not restoring order at a GCP&T park or paved trail site, GCP&T Park Ranger Sgt. Darrell Hannah can be found restoring his 1970 Dodge Challenger. XENIA — Whether restoring order at Greene County Parks & Trails sites or restoring classic cars, GCP&T Ranger Sgt. Darrell Hannah has discovered a way to fit both into his life. 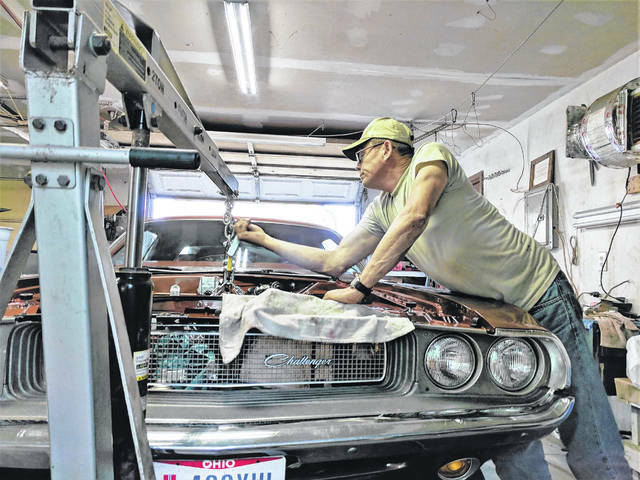 Hannah has been restoring his own cars throughout the years; his first restored car was a 1969 Chevrolet Camaro that he eventually traded for a 1970 Plymouth Roadrunner. “I gave that car to my younger brother Mike when he got his driver’s license just before for I left for the Navy,” he said. Hannah joined the GCP&T Ranger Division in 2010 as a reserve ranger and joined as a full-time employee in 2011; he was named a sergeant in 2018. He has also served in the Navy, as well as the Army and National Guard for 31 years, and will retire in April 2019 after multiple deployments. He first thought about being a ranger when he was a boy scout and attending summer camps. His interest deepened after spending several vacations with his children in national parks out west. There he learned rangers play a vital role in making sure park visitors enjoy their outdoor experiences. After returning from deployment to Iraq in 2008, Hannah decided it was finally time to act on his wish to become a park ranger. He began attending Hocking Technical College just a few weeks after unpacking his military gear and graduated from the National Ranger Institute in June 2009. One year later, Hannah was sworn in as a reserve ranger with GCP&T. As a GCP&T Ranger for more than 8 1/2 years, Hannah has had some interesting experiences in the parks including finding ​a 12-year-old runaway boy from Cedarville in Yellow Springs who was riding his bike to Minnesota, an ​injured Great Horned Owl that was taken to the Glen Helen Raptor Center, and an alleged six-foot python snake at the Narrows Reserve. When Hannah isn’t busy in the parks, you are likely to find him in his garage with his head under the hood of a vintage car. Hannah is currently restoring a 1970 Dodge Challenger including rebuilding the motor and transmission, interior work and exterior painting. Restoration work brings satisfaction and memories to Hannah. “It’s something I can do in my off time. I really enjoy restoring older cars. It reminds me of my teenage years and of the time I spent with my father. ​ These days, it’s a way to connect with my brothers, Ed and Mike, who love cars as much as I do” he said. Hannah and his brothers frequently travel to car shows with their cars. 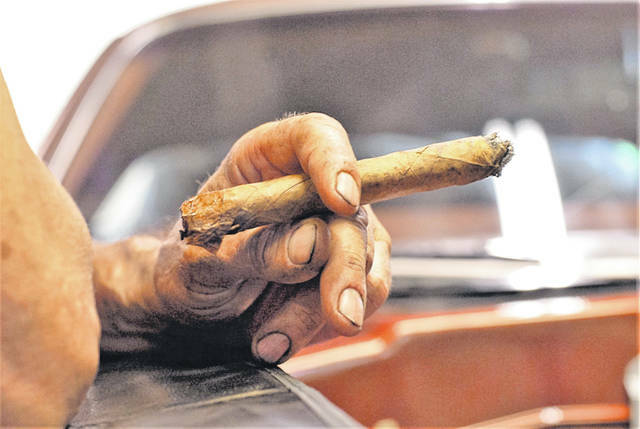 Car shows, he said, allow those who restore vehicles to be recognized for their workmanship and commitment to reviving valuable relics from the past. Hannah has been instrumental in planning GCP&T’s Caesar Ford Summer Fest Car Show that will be held 12-2 p.m. Saturday, June 1 at Caesar Ford Park, 520 S. Stringtown Road, Xenia. All cars can register on-site for free starting 9 a.m. Entry is free to view the cars. The next car on Hannah’s restoration list is a 1969 Mercury Cougar, and his father’s 1983 GMC pick-up truck. His dream car would be a 1968 Ford Mustang Fastback. “It’s the car Steve McQueen drove in the movie, ‘Bullet,’ “ he said with a grin. https://www.fairborndailyherald.com/wp-content/uploads/sites/50/2019/03/web1_2018-may-challenger-13.jpgPhotos courtesy GCCC When not restoring order at a GCP&T park or paved trail site, GCP&T Park Ranger Sgt. Darrell Hannah can be found restoring his 1970 Dodge Challenger. https://www.fairborndailyherald.com/wp-content/uploads/sites/50/2019/03/web1_Ranger2.jpgPhotos courtesy GCCC When not restoring order at a GCP&T park or paved trail site, GCP&T Park Ranger Sgt. Darrell Hannah can be found restoring his 1970 Dodge Challenger.